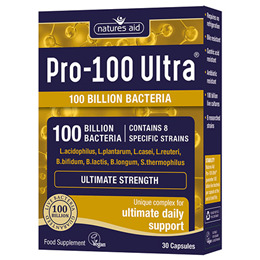 Natures Aid Pro-100 Ultra is a daily complex containing 8 extensively researched strains of bacteria; L. acidohpilus, L. plantarum, L. casei, L. reuteri, B. bifidum, B. lactis, B. longum and S. thermophilus providing 100 billion live bacteria per capsule. Over 100 trillion bacteria make up the internal microbiome. This delicate ecosystem can be disturbed by many things including antibiotics and illness. 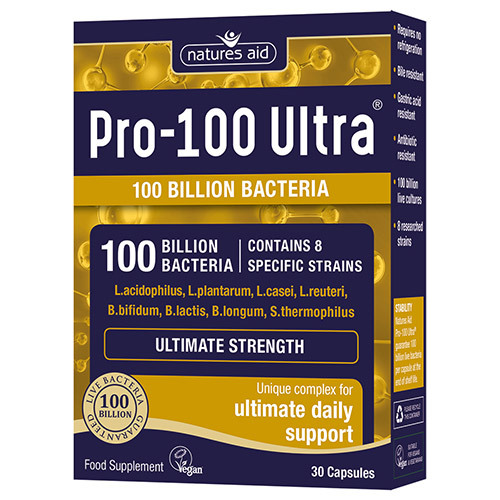 The bacteria chosen for Pro-100 Ultra are all proven to reach the gut intact and are antibiotic resistant. Pro-100 Ultra has been specially formulated by bio-chemists and nutritionists based on scientific research. Adults and children over 12 years: Take 1 capsule per day with food. Below are reviews of Natures Aid Pro-100 Ultra - Ultimate Daily Support - 30 Capsules by bodykind customers. If you have tried this product we'd love to hear what you think so please leave a review.